A security deposit of $500 is also required and will be authorized on your credit card 7 days prior to arrival. A charge may result for damage to the condo, missing contents, pool keys/condo keys or for exceeding the number of allowed overnight guests. 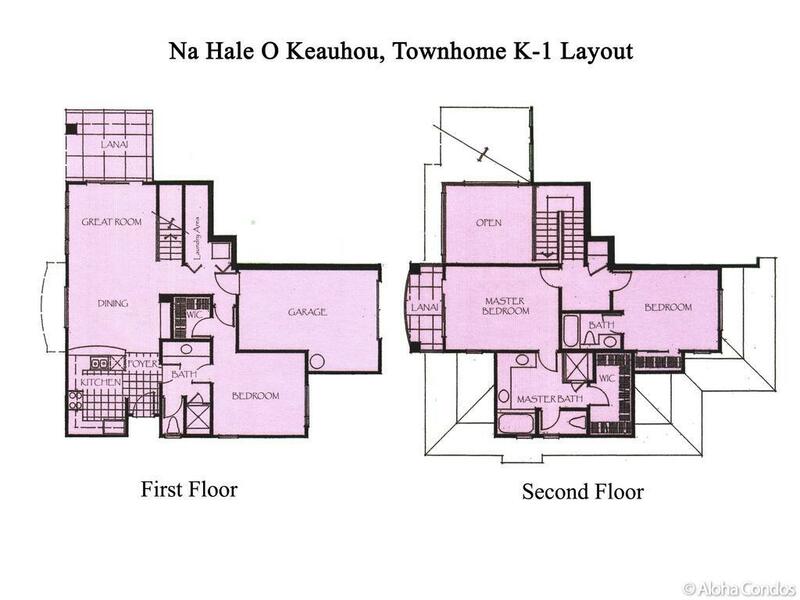 Na Hale O Keauhou K-1 is a spacious 1704 square foot 2-story luxury air-conditioned Townhome with Ocean Views. This delightful, well-appointed townhome is located on the western edge of the Private and Gated Na Hale O Keauhou Resort. New tiled floors bottom floor September 2015. Views of ocean horizon from both lanais. Gorgeous sunset views. Main lanai has circular table with seating for 6 plus a gas BBQ grill. Master bedroom lanai has 2 armchairs and a small glass table. Glass table with 6 chairs. 3 stools are adjacent at the kitchen counter. 2 chairs and a small glass table. Sunset views. 2 twin beds with a bedside table with lamp. Large closet. Ceiling Fan.
. This bathroom also accessible from hallway. Full size stacked washer/dryer and beach supplies located in laundry room. Parking available adjacent to building. No garage parking available. The Townhome was beautiful and well maintained. The three bedroom and three bath allowed the three couples privacy after a long day of enjoying the island activities. All of the beds were very comfortable. The only thing that could have been better was the barbeque which had not had a thorough cleaning in some time. Prior to leaving we gave the barbeque a thorough cleaning for the next guests. The pool and hot tube was amazing, the only draw back during our stay was the hot tub broke down the fourth day of our eight night stay and was not fixed until after we left. Our recommendation is to extend the hours of the pool and hot tub use from closing at 9 p.m. to close at 10 p.m. to allow guests more time to enjoy the pools. This place was great. It met all our needs!2 thumbs up!The unit is huge. Lots of space or our family of 5.The bbq at the unit was a great assetWe made use of the body boards and beach chairs, not to mention the beach umbrella(a must On a sunny day).The proximity to the pool was a nice bonus. This is our second year staying in K-1. Stayed for 6 weeks this time round! The condo is perfect for a family holiday. It is spacious with limited clutter to be concerned about with small children playing inside and out. The downstairs bedroom and bathroom provide a great “master bedroom” without worrying about stairs. There is another even larger Master bedroom and bathroom upstairs so two couples can have large rooms. The third bedroom is large enough for a couple of kids or push the twin beds together for another room with a king sized bed and private bathroom. Perfect for families. Tile throughout the living room is wonderful in a humid climate. Easy to clean up quickly. The new barbecue is awesome. Bigger makes it so handy to cook for 6 people. The linens and towels are quite adequate. There are lots of dishes to use. A few plastic plates and bowls for kids would be a great addition. Some of the frying pans are starting to wear with scratches in the Teflon coating. This condo is so spacious and easy for 6 people to have their own space if they choose. The manager was quite accommodating although we didn’t really have any issues for them. There are all kinds of beach toys for kids, snorkel gear and boogie boards to use. Beach chairs were in good shape. It is nice to have soap, toilet paper, laundry detergent shampoo and dishwasher capsules supplied rather than everyone who stays there buying their own.We hope to book again for next year! Our holiday was awesome. Tom and Sarah were very helpful and prompt to respond to any of our emails. I wouldn’t hesitate to book this unit again! Beautiful place to stay while in paraside! This condo exceeded all of our expectations. It was spacious, beautifully furnished and decorated, the grounds were lovely, the pool was so much fun for the kids. The only thing we needed were groceries, everything else was provided. There were boogie boards, grass mats, snorkel gear, beach chairs, cooler bags, a cooler, etc. There are three bedrooms and a couch with a pull-out bed in the living room, so plenty of room to sleep comfortable. Definitely spring for the extra per day for air conditioning. Well worth it! The place stayed comfortably cool and we never overheated while inside. If you rent this place, you will not be disappointed. Sometimes booking online is disappointing when you expect one thing and when you arrive it seems like less than the pictures demonstrated.This totally did not happen. The Townhome turned out to be actually more than expected. Very very nice and clean. Plenty of room for our family and very comfortable.We had a great time on the island with our family and I would highly recommend. What a well kept and well layed out townhouse. We have stayed at Na Hale before but found this townhouse in much better condition. The location of the townhouse is wonderful, close to pool, grocery store and Kona! The owners respond very quickly to all emails and provide lots of info about the townhouse as well as info about places and restaurants to visit. My only suggestions would be to provide a few more bath towels and to oil the lanai screen door as it makes a screech every time you open it. Both of these are very minor and easy fixes. We would definitely rent this townhouse again if available during our next trip to the island. Thanks for a fabulous holiday. A Very Nice Town home - Exceeded our Expectations. We stayed at Na Hale O Keauhou Townhome K-1 for 10 days in November; my wife, myself, our daughter and two adult grandchildren. This spacious, comfortable town home well exceeded our expectations, being very modern and finished to a high standard with good furnishings. It was the nicest property we have rented anywhere (and we have rented quite a few vacation properties over the past 15 years). There is a well equipped kitchen and we were pleasantly surprised with the little details, like condiments and seasonings for our meals. The three bedrooms, all with modern TV’s, have comfortable beds and nice en-suite bathrooms and walk-in closets. Also a good selection of beach stuff, like snorkels, chairs, goggles, fins, etc. Very clean, well maintained facility and surrounding property, and good, quiet, central air conditioning. Even a cupboard with books to read and games to play. We didn’t use the BBQ, but noted a full back-up tank of propane on hand in the garage – a nice touch. The pool area is a very short walk. The pool was never busy when we stayed there and includes a hot tub and shallow kid’s pool. This gated complex is well located, a short drive (1/2 mile) to a popular beach/lagoon area, and there is a very convenient shopping centre even closer (up the hill). When we visit the big island again, we will definitely choose this town home. Owners Tom and Sarah were most accommodating and even voluntarily refunded a portion of our rent when our son-in-law cancelled due to work commitments at the last minute, something they had no obligation to do. .
Our two week stay was easy and comfortable. Its very clean and has a functional layout, its in a great location, the pool is right next door, it felt safe, and everyone in the gated community that we met were pleasant. The kitchen supplies where way above other places we've rented including actual sharp knives and good quality pots and pans, a rice cooker, a grill, coffee maker (and grinder), much more. More that enough to do whatever type of cooking you like. Same for the beach gear. The garage was loaded with a bunch of snorkeling gear, three boogie boards, three beach chairs, a cooler that we used every day, a couple of beach umbrellas, and more. Not much for views from inside but if you walk to the back edge of the yard you get a nice ocean view with a direct view of sunsets. Our only issues where that our kids never figured out how to adjust the temperature in the upstairs shower so they used the Master shower instead. And, we never figured out how to use the apparently brand new TV in the downstairs bedroom. I'm sure there's an easy answer to both. Thank you for the wonderful stay at Na Hale O Keauhou. The condo was immaculate, spacious, comfortable, and well stocked for a family vacation. The location is central to all things in the Kona area and the complex is stunningly maintained.We cooked meals, made use of the beach equipment, and fully enjoyed making your condo our home for a week! Our only regret is that we were so busy exploring beaches that we didn't have time to use the pool. ;)Mahalo nui. Thank you for your review. We agree with your comments about the blinds in the downstairs bedroom and will be changing those blinds when we are there in June. Thank you. This condo has everything you need for a vacation long or short term. We stayed for the month of December 2016. Condo fit all of our needs. We had guests with mobility issues for one week. The down stairs bedroom and bath were perfect for them. There are no steps getting into the condo or inside the condo on the main floor, which was great for them. Our daughter and her family also visited during Christmas, we moved to the downstairs bedroom. The two upstairs bedrooms and baths fit their needs perfectly. Condo has great access roads close to it for getting around the island. There is a small shopping center close by, that has a grocery store, drug store, restaurants, post office, urgent care center, movie theaters, and more.The condo was spotless when we arrived, and we had a cleaning midway through our month, and she did a great job. Grounds are kept very neat also.The owners are great to work with. Any questions we had were quickly answered by e-mail. Would stay here again, if I visited the Big Island in the future. This was our first stay at Na Hale O Keauhou. We selected K-1 because it was exactly what we needed for our 10 day visit.. It was perfection! Had we walked through it previously to booking, we would have immediately chosen this beautifully appointed townhouse. Sarah and Tom have thought of everything. From the décor` to the comfort of each room, we felt at home. The kitchen had everything we needed to prepare and enjoy our meals, Having three roomy bedrooms with plenty of drawer and closet space was a plus, not to mention having three bathrooms...one for each bedroom. It is a luxury for us to have all the conveniences of home....a washer and dryer, a huge master bath with a large shower, separate bathtub, double vanity and a walk-in closet. One night, we barbequed on the lanai using the gas grill and enjoyed the setting sun. Paradise! There were additional perks that we appreciated. There was a garage for our rental car, beach equipment, and it was a short walk to the pool and exercise facility. We look forward to our next visit at K-1. It was, by far, the best vacation home we have stayed in over our more than our 6 years and12 visits to The Big Island! Just Better LIVE! This place is AAA rated! We had a great time in unit K-1! Plenty of toys to take to the beach, towels, well stocked enough to have a couple small gatherings with friends. Lots of room for the 5 of us and you cannot beat the location! As former BI residents we found this place to be just the ticket! We used the pool a few times and the hot tub and they were clean although a tad over warm. To be expected in August, for sure! We just walked down to the bay to jump in or traveled to our many favorite beaches. Only reason I didn't give it 5 stars is that the downstairs king that my hubby and I shared was a bit worn and hard. He woke with a sore back each day :( I can't speak for the upstairs one as my 17 year old daughter got that one! Also the recycling was limited to only glass, aluminum and plastic bottles. This seems to be a common problem with rentals and in Hawaii, in general. Tom and Sarah were wonderful over the phone as well. I'm not sure what the winter time price would be but it was incredibly reasonable in August and made it possible for our family to relax as we saved a ton of money on food by cooking in the well stocked kitchen. Can't think of a better place to stay! I really can't think of anywhere I would have rather stayed; this condo was great from start to finish. It had plenty of room for the five of us, and three bathrooms helps a lot. The decor was very nice, with granite countertops and nice kitchen cabinets. The beach stuff in the garage helped a lot when it came time to take the obligatory trip to the beach, especially the chairs and boogie boards (three of them). Everyone slept great on the beds; they were very comfortable. We stayed for 8ish days and slept well each night. A/C was great for this July trip; I can't imagine not having it during this part of the year...I don't know about other seasons, but we sure needed it. The complex was very quiet; we were never woken by anything going on outside. All in all, it was great home base to explore the island. We love to snorkel, and it was closer to Honaunau and Captain Cook than staying in Kona. That having been said, trips to north of Kona, where a lot of good beaches and scenery are, are a little longer. What a great find! My husband, daughter, and I stayed here for 2 weeks and did not want to leave! The townhome is in a perfect location. Easy to find, great views, close to shopping, the airport, beaches, and sights, yet one doesn't feel as though they are in a city. The Na Hale O Keauhou complex is secure, quiet, beautifully landscaped, and very well kept. The staff were friendly and polite. The pool and hot tub were clean and a pleasure to swim in and relax by. Our 3 bedroom unit (K-1) was wonderful! The place was immaculate and everything we could think of was provided: cookware, BBQ, laundry (with soap/dryer sheets), beach towels, bathroom toiletries, boogie boards, pool noodles, books, puzzles, etc. It was a real treat not to have to lug all that stuff from home! We also appreciated the high speed internet and TV. The place was beautifully decorated, and comfortable as well. My husband has trouble sleeping in general, and yet was able to get a good nights rest here. Although we opted for the air conditioning, one wouldn't necessarily need it, as you could use the numerous fans and also open the patio door and front door (screened) and let the cool breeze blow through. Communication was excellent; we had a couple of questions about the unit during our stay, and they were answered immediately via email. Instructions on everything were easily found, and material on good tourist spots was also provided. We thought the price was very reasonable for what we got, and we would love to come back again another time. Mahalo! Thank you for your input. As we had discussed in our previous emails, we will be working on the living room/ dining rooms to accommodate more seating, better lighting and end tables. I'm sorry we never got the chance to meet. If we had, I would have been happy to do what I could to make your stay as enjoyable as possible. Most rental owners are very open to suggestions for improving their guest's experience. I'm sure Tom and Sarah would have gladly consented to some helpful additions to the condo. I know that plans are already in the works for replacing the dining table and chairs. They are very sturdy but a bit unwieldy. I'm glad your overall impression of the condo and complex were positive. Na Hale O Keauhou is a beautiful property. I hope you'll consider staying with us again. If you do, please remember that I'm just a phone call or email away.